Whenever I add a network printer to one of my Windows computers at home I end up with a reference to a hard-coded IP address. That means that the next time my home router reboots and assigns a different IP address, I lose the ability to print. Having the printer configured to a hard-coded IP address is like browsing to 74.125.25.105 instead of www.google.com. In order to ensure reliable printing for my family I have had to do some printer configuration jujitsu and I want to share my steps here, if only so that I’ll remember them next time. The basic trick is to find the name of the printer and then change the printer configuration to reference the name instead of the IP address. I don’t know why Windows doesn’t do this by default – this problem has existed for many years, with many printers. All of these steps were done on Windows 7 with a Brother MFC-7820N printer, but I’ve done similar steps with other printers. You may also be able to get to this dialog by double-clicking the printer and then double-clicking Customize your printer. Poke around until you find it. If your computer has some printer history then there may be many TCP/IP ports. Pay close attention to which one is selected for your printer because clicking anywhere in the list will change the selected port. In this case my printer is associated with TCP/IP port number 192.168.0.193 rather than a name and I need to fix this in order to keep it working. The next step is to figure out the printer name. There are a couple of ways of doing this. For both of these techniques you should probably make sure that the printer is on, in case it needs to respond. In this case BRN_88AA08 is the printer’s name. This command confirms that the printer’s name is BRN_88AA08. We can confirm this one more time by pinging the printer name and observing that it resolves to the original IP address. Now we just have to tell Windows to use the printer name instead of the hard-coded IP address. 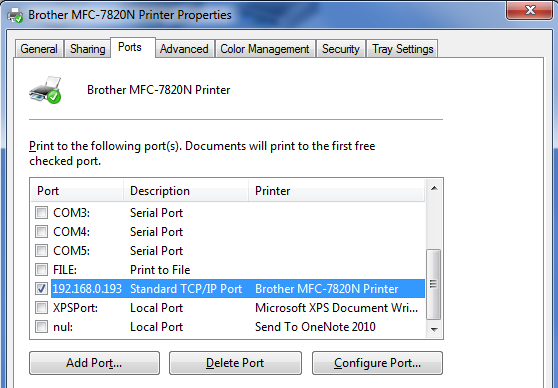 To do that click on Add Port… from the Ports tab of the Printer Properties dialog. 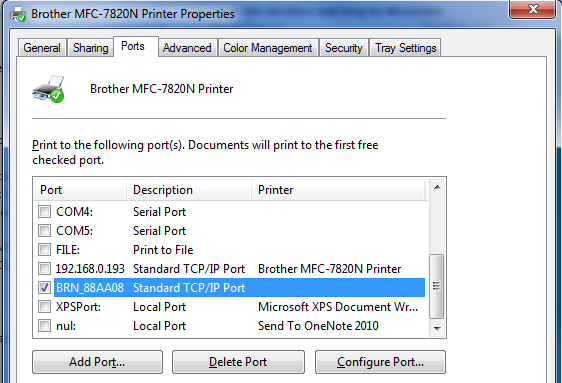 Select Standard TCP/IP Port, click New Port… again, then type the printer name into the Printer Name field. The default Port Name should be fine. Then click Next. Windows will spend a while detecting the port and will then add it to the list. Finally you will end back at this dialog where you can select your port name, and optionally delete the old (and now unneeded) hard-coded port. That’s it. Your kids’ homework assignments will now print reliably without requiring emergency tech support calls. You can do the process slightly faster by using Configure Port… on the original numeric IP address and just changing the Printer Name or IP Address field. This avoids the port detection phase. But, this leaves the port name as the numeric IP address, which seems a bit confusing. Adding the new port has to be done on every computer that adds the printer, but at least you don’t have to repeat the steps to find the printer name, so the process can go quite quickly. And again, I really don’t understand why Windows doesn’t do this automatically. I know I’m not the only person who has hit this problem. Update: I just verified that the problem (and solution) are identical in Windows 8.1. No wonder I hate computers. This entry was posted in Computers and Internet, Rants and tagged network printers; nbtstat. Bookmark the permalink. My solution was to change my router configuration to assign a fixed IP address to the printer. The other option is to set the printer itself to have a static IP – like the router based solution, it means you only have to fix it once, instead of once per windows machine. I’m not sure how. I can tell the printer to have a static IP, but I’m unclear on how it negotiates that with the router. It does not need to as long as the router’s DHCP IP address range is separate from the static IPs. The router could e.g. use 1-100 for DHCP while 101-255 are for static addresses. Last address of a subnet is not usable, it’s a broadcast address. On a related note, a good habit is to use the actual last address for the router (usually 254). Then you can easily tell whether you ran out of addresses just by checking what’s on the network. The ideal approach IMO is to associate the desired IP to the printer’s MAC address. We call these “DHCP Reservations” although your router might call them static leases, or some other cutesy name. The benefit is you can still access things by name, since the DHCP usually talks to the DNS. On most home routers, both services are handled by the same daemon anyway (dnsmasq). Every device on my home network has a DHCP reserved IP address. Client configuration is painless because it’s still DHCP. Issues like this don’t occur because IP addresses never change. Re-configuring a router is annoying but that doesn’t happen very often. Every new device does require router configuration, but it adds a layer of security and I get to name them so I prefer it that way. It helps that I use Tomato router firmware which makes it really easy to configure this way. I suspect Windows still uses the IP address because the upside is that you can still print if your DNS or WINS server is unreachable. In business environments, resources like printers are treated like servers and typically given static/reserved IP addresses. Very good. I had the same job over the holidays and arrived at the same solution after a lot of messing around. I think with this page in front of me and if the printer hadn’t somehow wiped all its network settings, I could have a chance of pulling it off remotely next time. If you set a value for more than one of these entries be sure that they match, else the SPOOLER will not be able to connect. Before you setup a network printer create the appropriate *.REG, stop the SPOOLER service, import the *.REG, restart the SPOOLER service and notice your custom printer port to bind your printer driver to. If I understand correctly, this is basically a way of automating the process that I describe? As in, the values that I was changing are going into the registry so why not change them with a .reg file? As bonus you can use the never changing MAC address instead of the rather volatile IP address or hostname (which 1. can typically be changed in the printer’s configuration, and 2. might not be resolved on the Windows client if the print server does not broadcast it per NetBIOS or register it with the DHCP/DNS server). Long story short: with only the MAC address you are on the safe side. I preconfigure the TCP/IP ports for network printers since Windows 2000 this way. 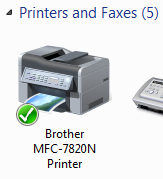 It’s odd you had to do this for a Brother printer. 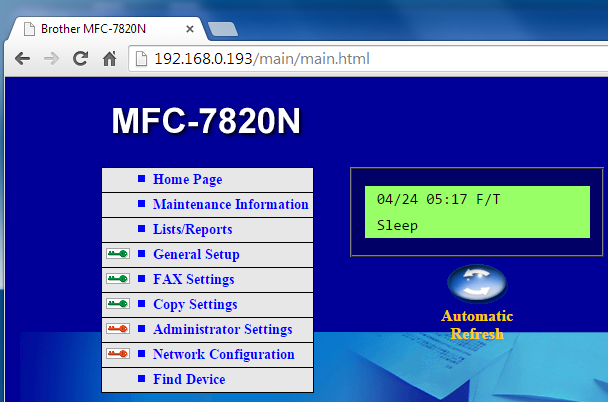 Their setup program is intelligent enough to do this for you, my MFC-7460DN is already using the node name rather than an IP.